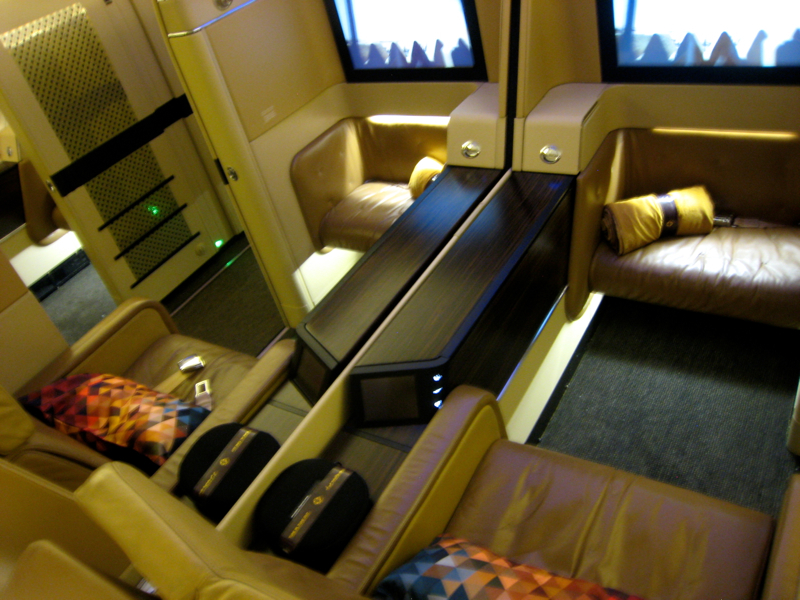 Etihad's First Class Cabin on the 777-300ER has 8 enclosed suites in two rows with a 1-2-1 configuration. 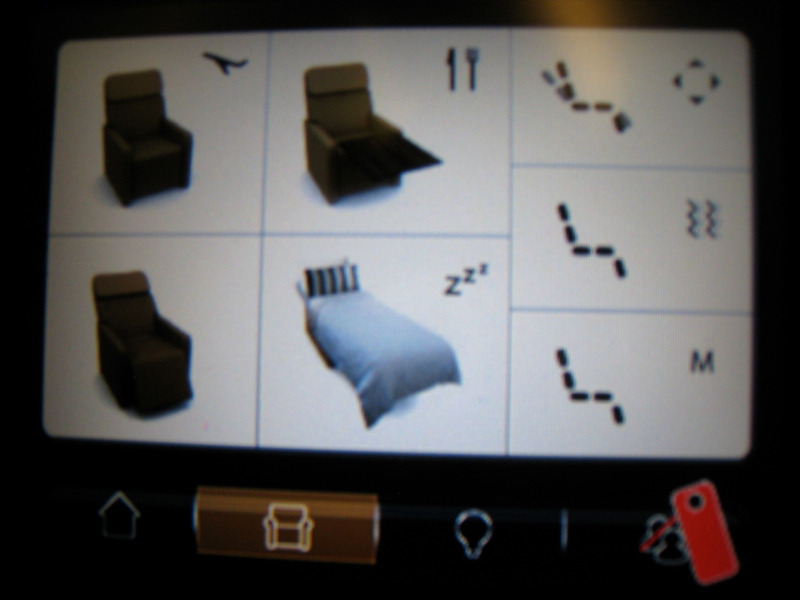 Unlike Etihad First Class on the 787-9, there are no rear facing seats; all face forwards. If you're traveling solo, as I was, I'd recommend 2A or 2K, which are window seats on the left and right sides respectively, which helps avoid potential noise from the lavatories and galley when you're seated in row 1. I was in Suite 2K, a window seat on the right in the second row. 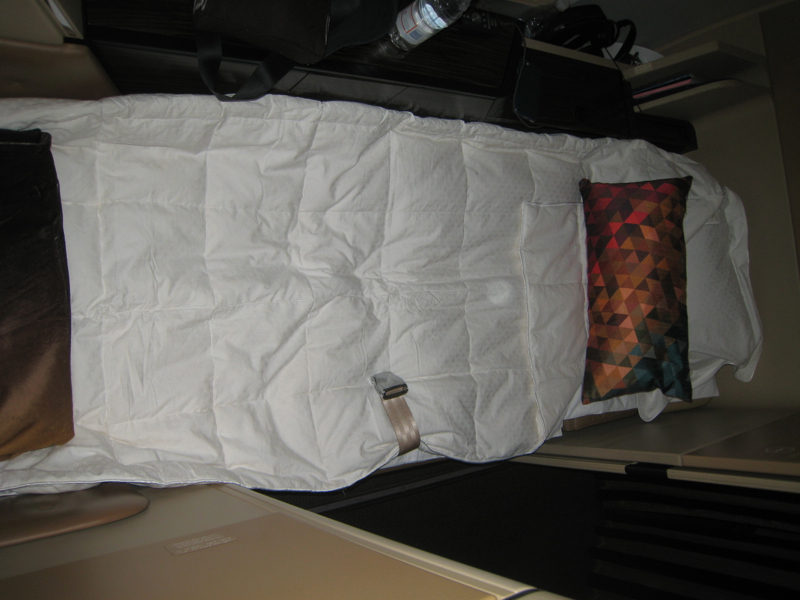 Etihad's first class seat was as comfortable as I remembered from my previous Etihad first class flight from Abu Dhabi to NYC JFK a couple years ago. I liked the privacy afforded by the closing doors, especially since on my flight the first class cabin was almost completely full. In fact, I barely noticed anyone else in the cabin, except initially the two women in the middle seats to my left, who were a bit noisy and gauche; but once they closed their doors and I closed mine, it was completely peaceful. What I really like about Etihad's first class seat design is how intuitive it is to use the seat controls and how convenient the use of the seat space is. I liked that on the right hand side there was a flat space to put drinks, snacks, mobile devices, or to write on. It wasn't necessary to open up the table. I really liked this feature, since the table can easily be in the way if you have to open it up for any drinks or snacks. On the ottoman was a very soft blanket. While I wasn't sure I'd have occasion to use it, the cabin ended up being a comfortably cool temperature and the blanket came in handy. 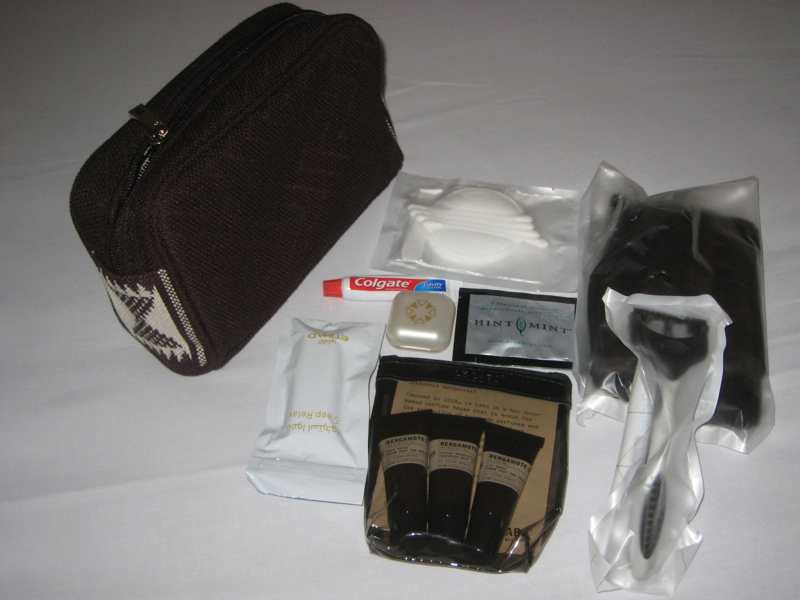 I rarely use anything in airline amenity kits, but here's a photo of the contents of the current Etihad First Class amenity kit for men. As you can see, it's pretty much identical to the one for women, just in a different case and with the addition of a razor. And while I didn't don them, the Etihad size L pajamas more or less fit me (top was a bit short), and I'm 6'5. I was the first person on board, and the flight attendant Florentina introduced herself and asked if I would like champagne. 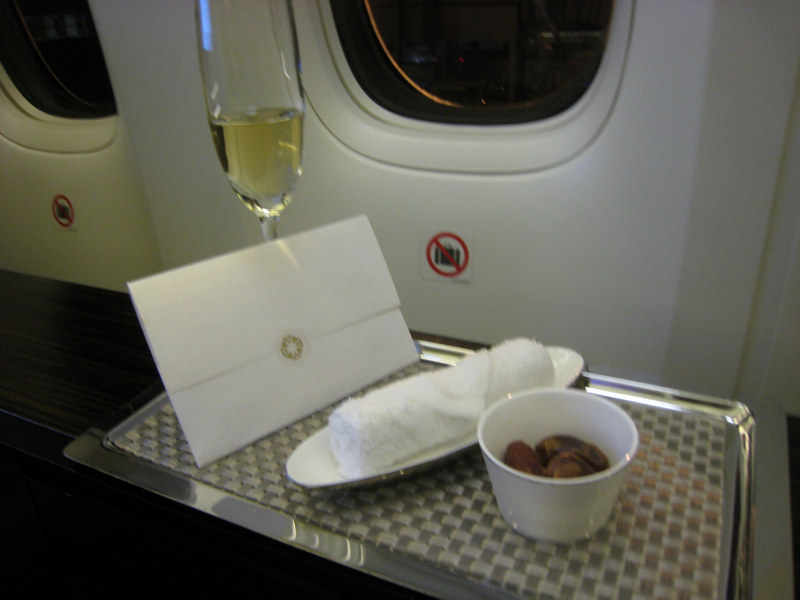 Although not normally a champagne drinker, I said yes, and she brought me a tray with champagne, a welcome note and dates. I wasn't sure if there would be a scheduled dinner due to the late time of the flight, so I asked if dinner would be served. She replied that dining was on demand, and asked if I had flown Etihad First Class before. 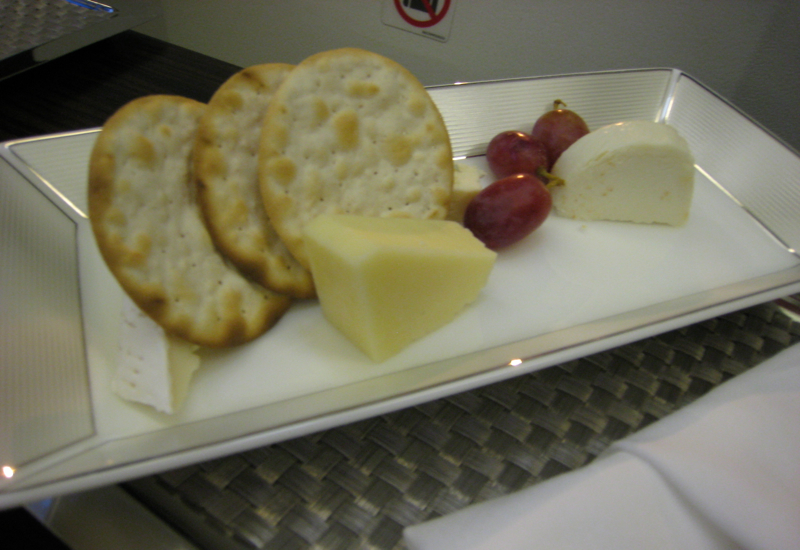 I replied that I had, and deciding I needed to prove my first class bona fides, plus that cheese would go really well with champagne and dates, I asked if I could have a pre-flight cheese plate. Florentina said she wasn't sure the food service would be ready in time, but she'd do her best. 5 minutes later, I was brought half a cucumber sandwich, which I immediately sent back, and repeated my request for a cheese plate. 5 minutes after that, I received my pre-flight cheese plate of Camembert, blue cheese (these ones are hidden behind the crackrers in the picture), cheddar and chevre. It was delicious, and paired better with the champagne than the dates. 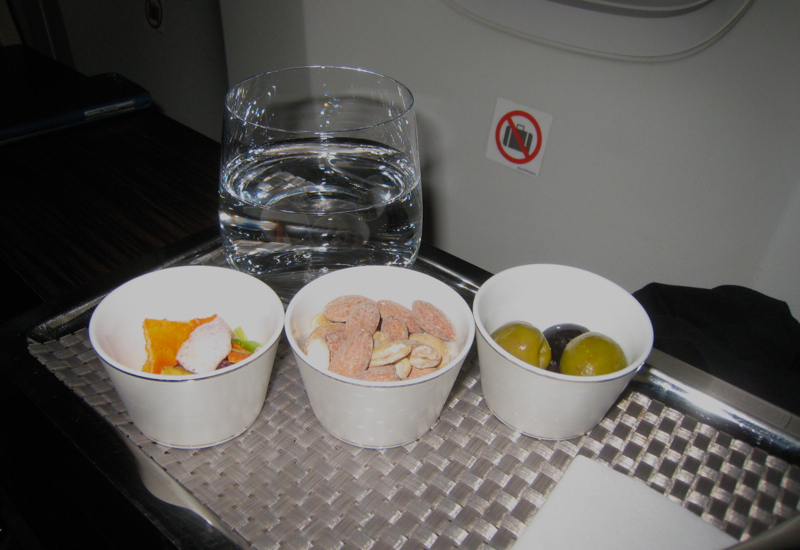 Once we'd reached cruising altitude and the seatbelt signs were turned off, I was given a tray of snacks: vegetable chips, room temperature mixed nuts, and olives, along with the glass of water I'd requested. 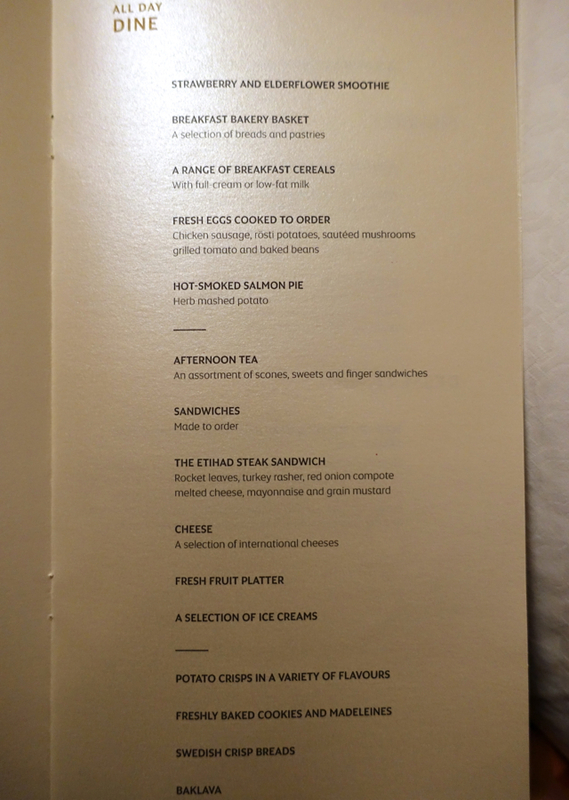 I was asked my menu selection after receiving these snacks, and chose the mezze as a starter and the Etihad Steak Sandwich. 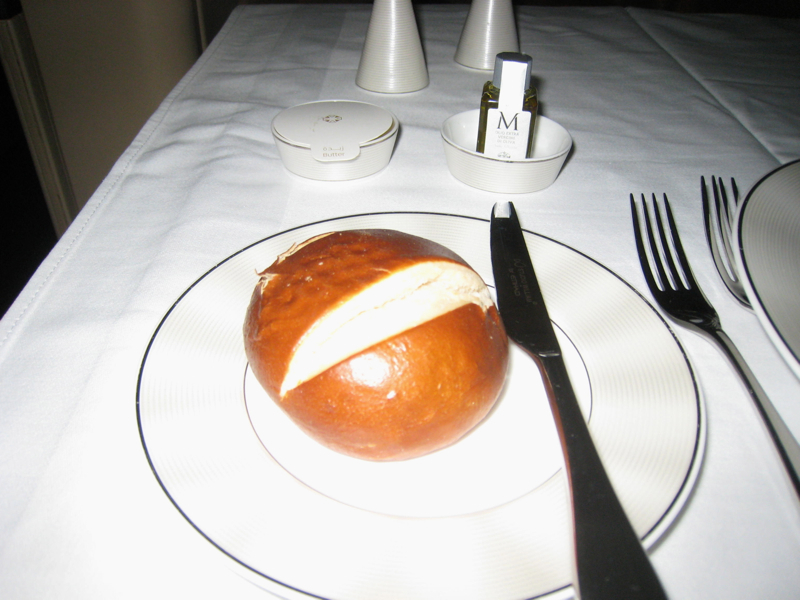 But first, my table was set, I was given a choice of bread, from which I chose a pretzel roll. 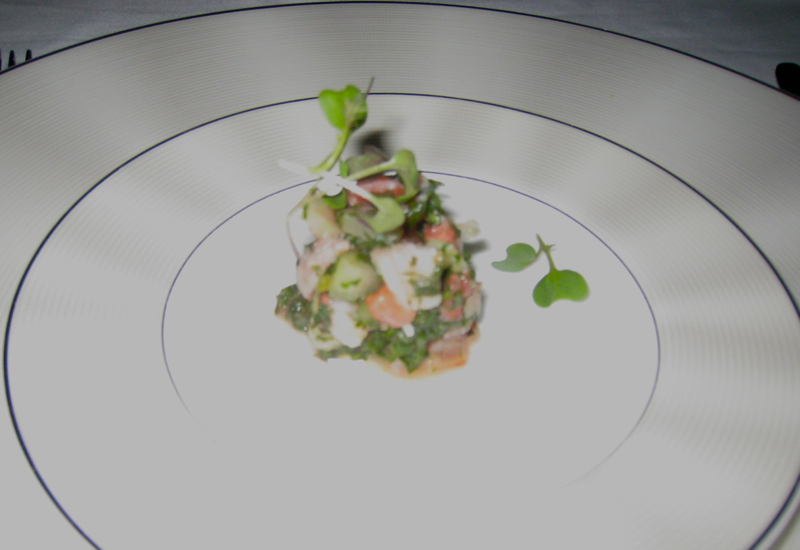 The amuse bouche was a chilled seafood herb salad. The coolness and texture was pleasant, although taste-wise it wasn't particularly memorable. The Arabic Mezze included baba ganoush, a tabouli-like salad, savory vegetarian pastry and my favorite, a sun dried tomato dip. 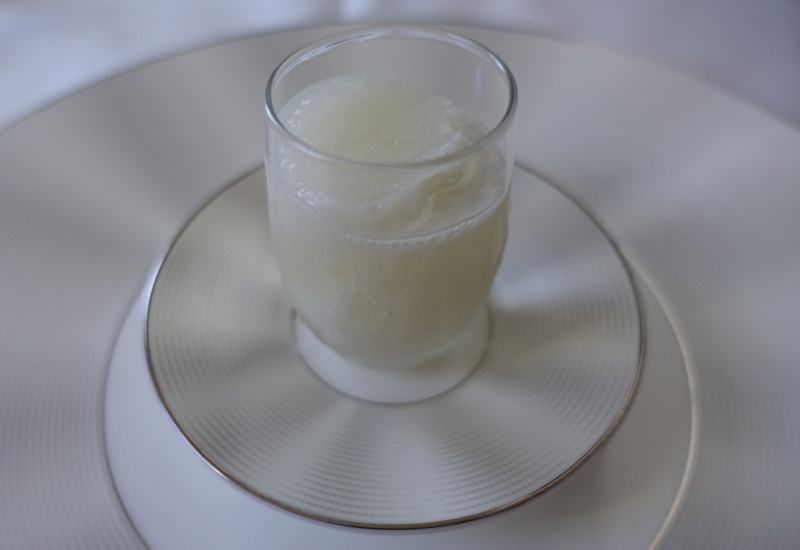 Next they offered a palate cleanser, the same lemon sorbet Hilary had on her flight, although he flight attendant serving it called it a lemon granita (granitas usually have a coarser texture). 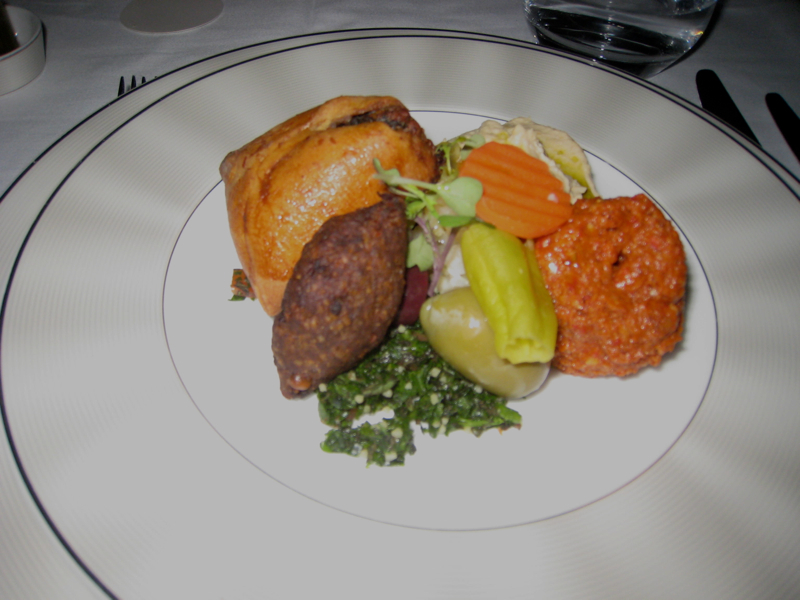 After the cheese plate, this was the best thing I'd eaten at that point, since the mezze, surprisingly for Etihad, was mediocre. 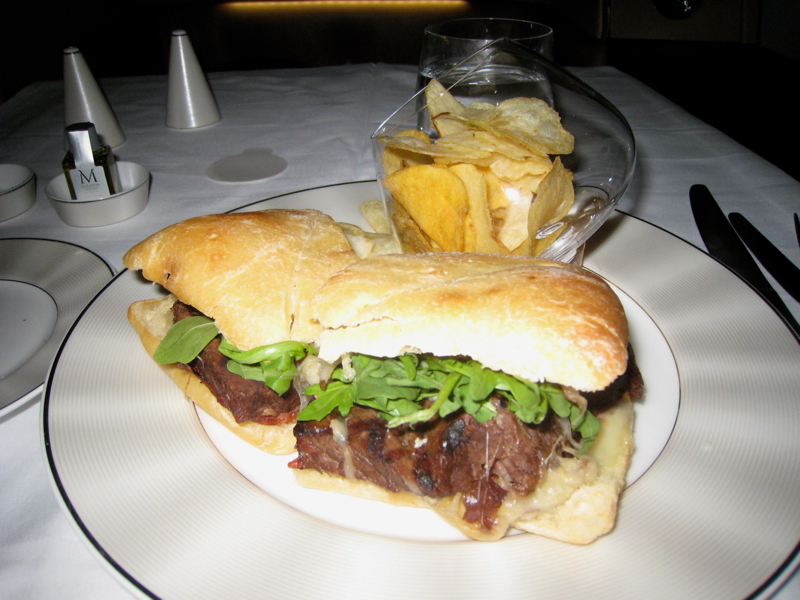 I really liked the Etihad Steak Sandwich, with its fresh, crusty bread and flavorful steak and arugala. I also liked the chips that accompanied it. 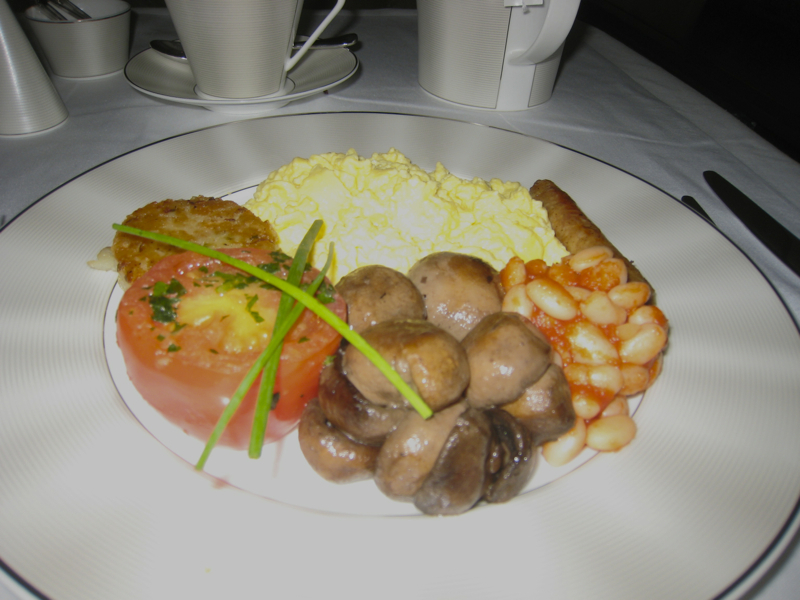 In the morning, I chose scrambled eggs, mushrooms, tomato and baked beans for breakfast, along with a cinnamon roll from the pastry basket. Everything was perfectly fine, but nothing unique or that interesting–just standard breakfast fare. Next it was time to get some sleep. I asked for turndown service, while I went to brush teeth. The bathroom was smaller than the one in Hilary's post, and a bit messy since others had used it and it hadn't been refreshed. Even though I was given the same type of pajamas as in Hilary's post, in size L, which fit me, I opted not to change into them since I was already wearing comfortable clothes. I came back and lay down on the bed, which fit me, which I always am happy about (I'm 6'5). I just wish there were more pillows. 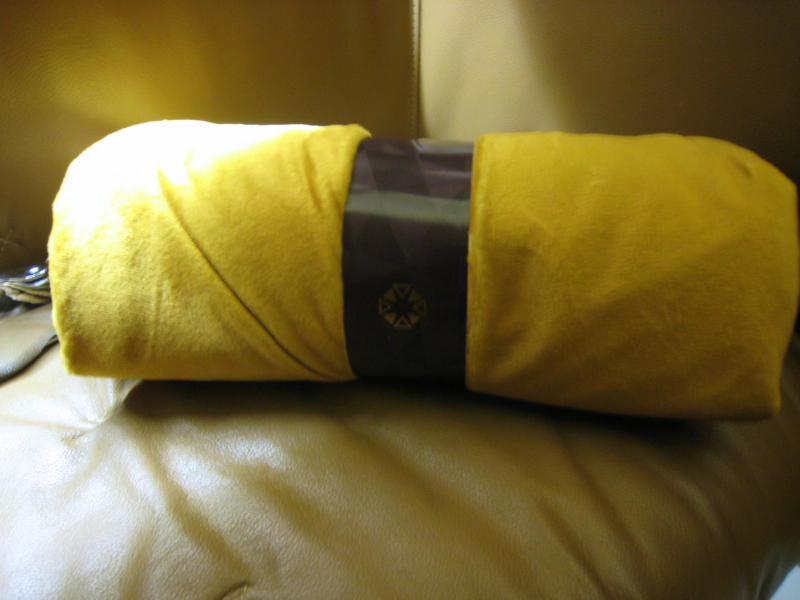 The cabin was a good temperature–not too warm, as is sometimes the case–so I used the blanket. I slept well and liked the admittedly gimmicky cycling through the colors of the rainbow, then the stars on the ceiling. Before the flight took off, I checked the IFE. My first set of headphones had static problems, so I had to get new ones, which worked fine. I chose Interstellar as my first film. Because I was prepared for the abuse of science in the film (a planet orbiting a black hole should not have light and shadows), I enjoyed the film. During breakfast I watched the first half of Gone Girl, which has been described as Fight Club for women. I really like when Ben Affleck is cast to match my perception of him in real life: a loutish buffoon who still has some discernible charm. I would want to kill him too. 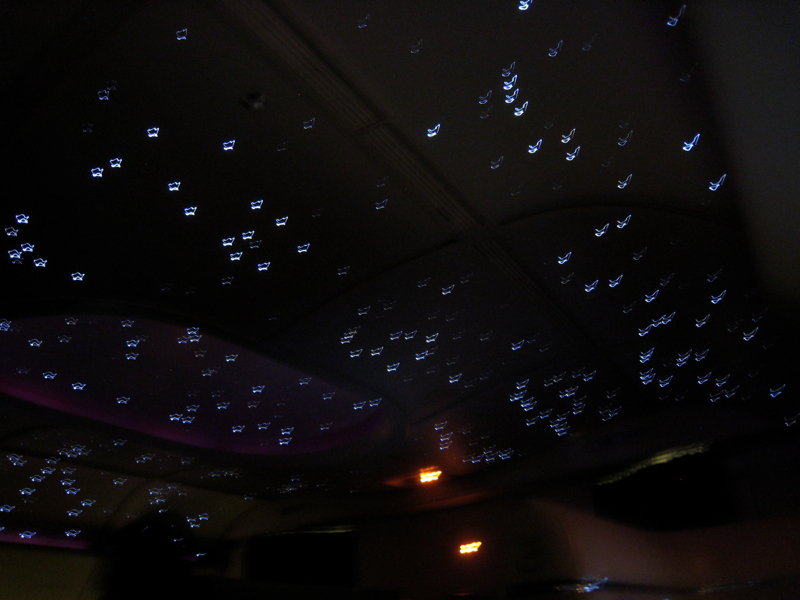 Although there was no one particular aspect that completely bowled me over, I'd have to say that this was one of the most enjoyable flight experiences I've had in quite awhile, with the exception of Singapore Suites on the A380 (where the bed and food are better). The Etihad flight attendants were always helpful and very pleasant, and everything was convenent and easy. I like when my first class experience is comfortable but not fussy. 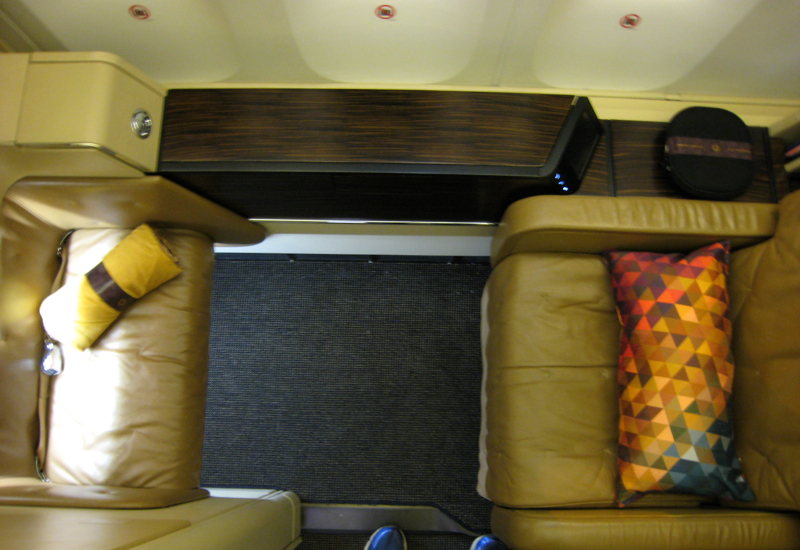 If you've flown Etihad First Class on the 777-300ER recently, what was your experience?